In 1822, Jean-Daniel Colladen, a Swiss physicist/engineer and Charles-Francois Sturm, a mathematician, used an underwater bell in an attempt to calculate the speed of sound in the waters of Lake Geneva, Switzerland . In his experiment an underwater bell was struck simultaneously with ignition of gunpowder. The flash from the ignition was observed 10 miles away and compared with the arrival of the sound from the bell underwater heard through a trumpet-like device in the water. In spite of these crude instruments, they managed to determine that the speed of sound under water was 1435 metres/second, a figure not too different from what is known today. As ultrasonics in general follows the principles delineated in acoustics, its development, particularly in the early years, is to some extent embedded in the broad developments in acoustics. The study of acoustics probably had its beginning with the Greek philosopher Pythagorus (6th Century B.C. ), whose experiments on the properties of vibrating strings were so popular that they led to a tuning system that bears his name (the Sonometer). Aristotle (4th century BC) assumed (correctly) that a sound wave resonates in air through motion of the air; a philosphy-based hypothesis more than one of experimental physics. Vitruvius (1st century BC), determined the correct mechanism for the movement of sound waves, and he contributed substantially to the acoustic design of theatres, because he was an architect. Boethius (6th century AD), the Roman philosopher, documented several ideas relating science to music, including a suggestion that the human perception of pitch is related to the physical property of frequency. Galileo Galilei (1564-1642) is said to have started to modern studies of acoustics. He elevated the study of vibrations and the correlation between pitch and frequency of the sound source to scientific standards. His interest in sound was inspired in part by his father, who was a mathematician, musician, and composer. Following Galileo's foundation work, progress in acoustics came relatively quickly. The French mathematician Marin Mersenne studied the vibration of stretched strings; the results of these studies were summarized in the three Mersenne's laws. Mersenne's Harmonicorum Libri (1636) provided the basis for modern musical acoustics. Later in the century Robert Hooke, the English physicist, first produced a sound wave of known frequency, using a rotating cog wheel as a measuring device. Further developed in the 19th century by the French physicist Félix Savart, and now commonly called Savart's disk, this device is often used today for demonstrations during physics lectures. In 1822, Swiss physicist Daniel Colladen used an underwater bell and successfully estimated the speed of sound in the waters of Lake Geneva. In the late 17th and early 18th centuries, detailed studies of the relationship between frequency and pitch and of waves in stretched strings were carried out by the French physicist Joseph Sauveur, who provided a legacy of acoustic terms used to this day and first suggested the name acoustics for the study of sound. In the early 1900's, lightships used a ranging system combination of an underwater gong and a foghorn on deck. The crew on approaching ships could hear both. The underwater sound was received by the use of a hydrophone on the hull. By timing the difference of the two sounds, they could determine their approximate distance from the lightship. Investigations of high-frequency waves did not originate until the 19th century. The era of modern ultrasonics started about 1917, with Langevin's use of high-frequency acoustic waves and quartz resonators for submarine detection. Since that time, the field has grown enormously, with applications found in science, industry, medicine and other areas. Underwater detection systems were developed for the purpose of underwater navigation by submarines in World war I and in particular after the Titanic sank in 1912. Alexander Belm in Vienna, described an underwater echo-sounding device in the same year. Within a week of the Titanic tragedy, Lewis Richardson filed a patent with the British patent office for echo ranging with airborne sound, following a month later with a patent application for the underwater equivalent. The first functioning echo ranger, however, was patented in the United States in 1914 by Canadian Reginald A. Fessenden, who worked for the Submarine Signal Company. Fessenden's device was an electric oscillator that emitted a low-frequency noise and then switched to a receiver to listen for echoes; it was able to detect an iceberg underwater from 2 miles away, although it could not precisely determine its direction. Sergei Y. Sokolov at the V.I. Ulyanov (Lenin) Electrotechnical Institute proposed in 1928, and a few years later demonstrated a through-transmission technique for flaw detection in metals. He advanced his idea in the late 1920s, at a time when the required technology did not exist. He proposed that such technique could be used to detect irreguarities in solids such as metals. The resolution of the experimental devices which he fabricated was however poor and could not be used at a practical level. Sokolov subsequently described a different and obviously the more important concept in ultrasonic applications. He demonstrated that sound waves could be used as a new form of microscope, basing on a reflective principle. Sokolov recognized that a 'microscope' using sound waves with a frequency of 3,000 megahertz (MHz) would have a resolution equal to that of the optical microscope. It was nevertheless not until the late 1930s that the technology for such devices was progressively developed, and the high frequencies required for Sokolov's microscope are found in microwave and ultrasonic systems used for radar and underwater navigation. In the reflection technique, a pulsed sound wave is transmitted from one side of the sample, reflected off the far side, and returned to a receiver located at the starting point. Upon impinging on a flaw or crack in the material, the signal is reflected and its traveling time altered. The actual delay becomes a measure of the flaw's location; a map of the material can be generated to illustrate the location and geometry of the flaws. In the through-transmission method, the transmitter and receiver are located on opposite sides of the material; interruptions in the passage of sound waves are used to locate and measure flaws. Usually a water medium is employed in which transmitter, sample, and receiver are immersed. The equipment suggested by Sokolov which could generate very short pulses necessary to measure the brief propagation time of their returning echoes was not available until the 1940s. 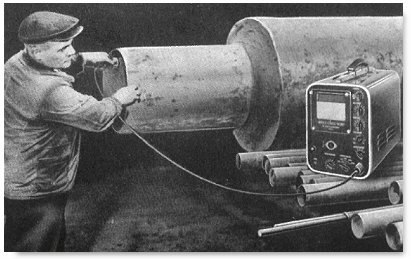 Industrial use of ultrasonic testing apparently started spontaneously at around similar times in the United States and Great Britain. Such technology had also been in place in Germany and Japan, but developments had been curtailed because of the second world war. The key-persons, Floyd Firestone, Donald Sproule and Adolf Trost had no knowledge of each other as they worked strictly in secret. Not even their patent-applications were published. Sproule and Trost used transmission-technique with seperate transmitter- and receiver-probes. Trost invented the so-called "Trost-Tonge". The 2 probes were contacted on opposite sides of a plate, held in same axis by a mechanical device - the tonge - and coupled to both surfaces by continuously flowing water. Sproule placed the 2 probes on the same side of the workpiece. So he invented double-crystal probes. He used this combination also with variing distance from each other. Firestone was the first to realize the reflection-technique. He modified a radar instrument and developed a transmitter with short pulses and an amplifier with short dead-zone. Sproule eventually gave up the transmission method and filed a patent in 1952 entitled "the improvements in/ or relating to apparatus for flaw detection and velocity measurement by ultrasonic echo methods". Sproule and Firestone found industrial partners for their instruments: Kelvin-Hughes and Sperry Inc. Kelvin-Hughes produced their first commercial machine in 1952. Several years later, in Germany in 1949 two persons received information about the Firestone-Sperry-Reflectoscope by publications in technical papers: Josef Krautkrämer in Cologne and Karl Deutsch in Wuppertal. Both started developments - without knowledge of each other. Josef Krautkrämer and his brother Herbert were physicists, working in the field of oscilloscopes. They could develop ultrasonic instruments alone. Karl Deutsch, a mechanical engineer needed a partner for the electronics and found him with Hans-Werner Branscheid who had got some technical experience in radar-technique during the war. Within only one year both young and tiny companies could present their Ultrasonic testing-flaw-detectors, starting a competition still existing today. Later on more ultrasonic testing units came on the international markets: Siemens and Lehfeldt in Germany, Kretztechnik in Austria, Ultrasonique in France and Kelvin-Hughes in Britain. They all stopped their production before the 1970s. Kelvin-Hughes also stopped at the same time, Sperry was later renamed Automation Industries Inc.
Krautkrämer became world-wide market-leader in the early 60-ies and has kept this position until today. Besides Karl Deutsch new names came up: Nukem in Germany, Panametrics and Stavely (after Sonic and Harisonic) in USA, Sonatest and Sonomatic in Briatain, Gilardoni in Italy. Research into ultrasonics and metal-flaw detection in Japan was considerably curtailed when World war II broke out in 1941, at which time the Americans and the Germans were both diligently researching into ultrasonics and the development of the Radar. The study into Radar techniques in Japan was also in the disadvantage. As the war ended in 1945, research into high-power electronics was prohibited in Japan for some time (up till 1948, when developments of non-military electronics resumed). Japanese enterprises took on the research from the U.S. and England and soon developed its own flaw detectors in non-destructive testing. In about 1949, four Japanese companies started to manufacture their own flaw dectors. These were: the Mitsutbishi Electric Corporation, the Japan Radio Company (later became the Aloka Company), the Shimadsu Manufacturing Company and the Toyko Ultrasonic Industrial Company. Only Mitsubishi continued to expand in the field of non-destructive testing and the other companies moved on to other areas and in particular diagnostic medical ultrasound applications. The Japanese Society for Non-Destructive Inspection officially recognised the year 1952 as the first year non-destructive testing was implemented in Japan. The use of Ultrasonics in the field of medicine had nonetheless started initially with it's applications in therapy rather than diagnosis, utilising it's heating and disruptive effects on animal tissues. The destructive ability of high intensity ultrasound had been recognised in the 1920s from the time of Langévin when he noted destruction of school of fishes in the sea and pain induced in the hand when placed in a water tank insonated with high intensity ultrasound; and from the seminal work in the late 1920s from Robert Wood and the legendary Alfred Loomis in New York. In 1944, Lynn and Putnam successfully used ultrasound waves to destroy brain tissue in animals. William Fry and Russell Meyers performed craniotomies and used ultrasound to destroy parts of the basal ganglia in patients with Parkinsonism. Peter Lindstrom reported ablation of frontal lobe tissue in moribound patients to alleviate their pain from carcinomatosis. Ultrasonics was also extensively used in physical and rehabilitation medicine. Jerome Gersten reported in 1953 the use of ultrasound in the treatment of patients with rheumatic arthritis. Several groups such as the Peter Wells group in Bristol, England, the Mischele Arslan group in Padua, Italy and the Douglas Gordon group in London used ultrasonic energy in the treatment of Meniere's disease. 1822 Colladen used underwater bell to calculate the speed of sound in waters of Lake Geneva. 1830 Savart developed large, toothed wheel to generate very high frequencies. 1842 Magnetostrictive effect discovered by Joule. 1845 Stokes investigated effect of viscosity on attenuation. 1860 Tyndall developed the sensitive flame to detect high frequency waves. 1866 Kundt used dust figures in a tube to measure sound velocity. 1876 Galton invented the ultrasonic whistle. 1877 Rayleigh's "Theory of Sound" laid foundation for modern acoustics. 1880 Curie brothers discovered the piezoelectric effect. 1890 Koenig, studying audibility limits, produced vibrations up to 90,000 Hz. 1903 Lebedev and coworkers developed complete ultrasonic system to study absorption of waves. 1912 Sinking of Titanic led to proposals on use of acoustic waves to detect icebergs. 1912 Richardson files first patent for an underwater echo ranging sonar. 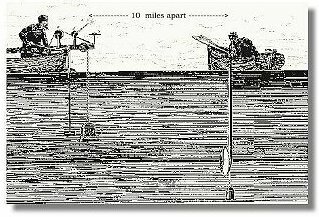 1914 Fessenden built first working sonar system in the United States which could detect icebergs two miles away. 1915 Langevin originated modern science of ultrasonics through work on the"Hydrophone" for submarine detection. 1921 Cady discovered the quartz stabilized oscillator. 1922 Hartmann developed the air-jet ultrasonic generator. 1925 Pierce developed the ultrasonic interferometer. 1926 Boyle and Lehmann discovered the effect of bubbles and cavitation in liquids by ultrasound. 1927 Wood and Loomis described effects of intense ultrasound. 1928 Pierce developed the magnetostrictive transducer. 1928 Herzfeld and Rice developed molecular theory for dispersion and absorption of sound in gases. 1928 Sokolov proposed use of ultrasound for flaw detection. 1930 Debye and Sears and Lucas and Biquard discover diffraction of light by ultrasound. 1930 Harvey reported on the physical, chemical, and biological effects of ultrasound in macromolecules, microorganisms and cells. 1931 Mulhauser obtained a patent for using two ultrasonic transducers to detect flaws in solids. 1937 Sokolov invented an ultrasonic image tube. 1938 Pierce and Griffin detect the ultrasonic cries of bats. 1939 Pohlman investigated the therapeutic uses of ultrasonics. 1940 Firestone, in the United States and Sproule, in Britain, discovered ultrasonic pulse-echo metal-flaw detection. 1940 Sonar extensively developed and used to detect submarines. 1941 "Reflectoscopes" extensively developed for non-destructive metal testing. 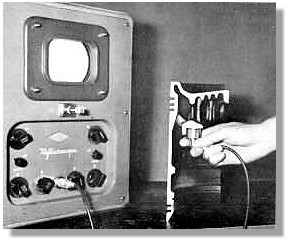 1942 Dussik brothers made first attempt at medical imaging with ultrasound. 1944 Lynn and Putnam successfully used ultrasound waves to destroy brain tissue of animals. 1945 Newer piezoelectric ceramics such as barium titanate discovered. 1945 Start of the development of power ultrasonic processes. 1948 Start of extensive study of ultrasonic medical imaging in the United States and Japan. 1954 Jaffe discovered the new piezoelectric ceramics lead titanate-zirconate. "Assessing the Risks for Modern Diagnostic Ultrasound Imaging" by William D. O’Brien, Jr., Bioacoustics Research Laboratory, Department of Electrical and Computer Engineering, University of Illinois, 1997.